Cycling at Bell Sound on South Caicos. Many of the streets in Cockburn Harbour are paved and perfect for cycling. South Caicos is a relatively small island, and cycles can used as a primary means of transportation. Sailrock Resort and East Bay Resort, the island’s two main resorts, provide complimentary bicycle usage, and cycles are available for rent in Cockburn Harbour. Sailrock Resort offers mountain bikes for guests instead of the more typical 'beach cruiser' resort bikes. Most of the roads in Cockburn Harbour are paved, along with the road leading to East Bay Resort. Sailrock Resort is a further distance away on the northern peninsular (around 5 miles from central Cockburn Harbour). Unless you’re an avid cyclist, we’d generally recommend a scooter or jeep rental instead of cycling. There are no dedicated cycle lanes or paths, however the road traffic is a fraction of what’s experienced on Providenciales, and many roads are limited to 20 MPH. Resort beach cruiser bicycles at Conch Ground on South Caicos. 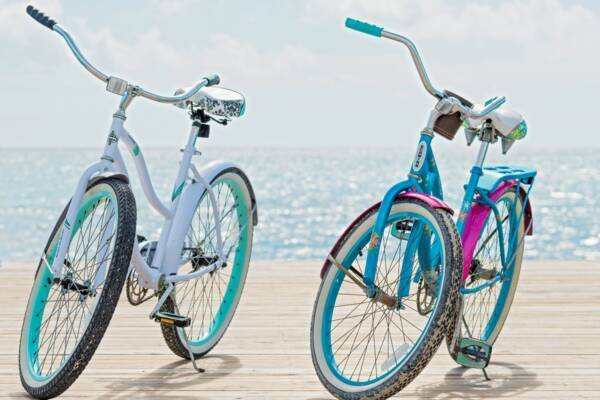 As mentioned, cycles are available complimentary from the resorts for guests. Otherwise, reserve in advance at one of the rental shops in downtown Cockburn Harbour. For rentals for non-resort guests, cycles can usually be delivered free of charge to your hotel or villa, or do the ferry dock. The intense sun can lead to dehydration, so take plenty of water with you, and always wear a helmet. We’d also advise a pair of sunglasses for dust. Traffic in Cockburn Harbour, the island’s main settlement, is limited to 20 MPH. Within the block-layout of this town, some roads are give-way junctions, whereas others have a right-of-way. There are typically walls and trees which can obscure your visibility splay, so we advise that you slow-down as you approach junctions in order to watch for traffic. 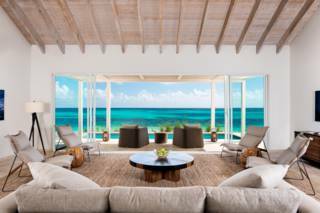 South Caicos has some truly beautiful beaches and coasts and are highly recommended to visitors. Be advised that some of the paths are quite sandy, and cycling can be somewhat more difficult that a normal unsurfaced or paved road. Sailrock resort is located about 5 miles from central Cockburn Harbour and around 4.5 miles from the airport. East Bay Resort is located about 1 mile from central Cockburn Harbour and about 2.5 miles from the airport. Plandon Cay Cut Beach is one of the most scenic areas in the country, and it’s highly recommend that you visit. This is about 2.5 miles north of Sailrock Resort, but is around 8.5 miles from East Bay Resort. Wear a helmet and sunglasses. Be aware of junctions in Cockburn Harbour, as visibility is reduced. Take water with you, as the sun is extremely intense. Sailrock Resorts offers complimentary bicycles for resort guests and those on their day trip package. Last reviewed by an editor on 6 February 2019.